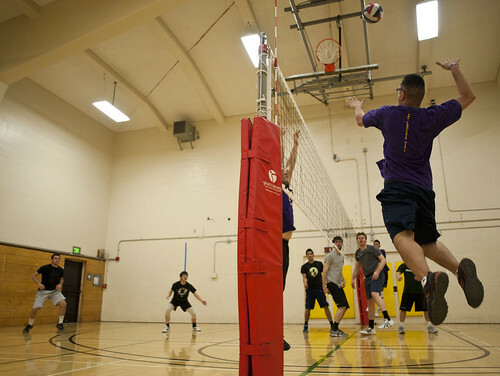 SF State's men's volleyball coach, Eric Ballelos, goes up for a hit against his players in a practice scrimmage, Feb. 16. Photo by Sam Battles. Student fee increases are nothing new, but this semester a newly-approved fee requires students to pay for a campus recreation center that will not be completed for several years after most students have moved on from the University. The $35 per semester fee was approved for fall of this academic year, effective this academic year; it will gradually increase each year until it reaches $160 each semester in 2014. Construction will not begin until 2015, with a target completion date sometime in 2017. Even though current students will be funding the center, their future access has yet to be guaranteed. The administration recently chose the current site of the Sutro Library over the currently abandoned School of the Arts site after the University determined that the Annex was too expensive to tear down. The various groups heading the project still have some major decisions to make in the upcoming years. After selecting the Sutro Library site, the next step is to hire an architecture firm to design the center, after which the various amenities and recreation and wellness rooms can be determined. According to Byrd, the student fees are final and the total projected cost will be between $80 million and $93 million. Future student enrollment, labor costs and the price fluctuation of various materials will affect the ultimate price tag. Franko Ali, vice president of university affairs for Associated Students Inc., said the project is 100 percent paid for by the student fee. The recreation department has put up the bond for construction and the money is a part of the student center account, held by the University. The fee proposals originated as a petition formed by the students who brought it to an advisory committee. Campus recreation, ASI and the student center got involved by working together to create a series of questionnaires before Fall 2010 to find out student interest in creating the center. After a student poll approval, the advisory committee brought the proposal to President Robert A. Corrigan, who approved it for the Fall 2010 semester. Despite the added costs of building the center, students who participate in club and intramural teams generally feel that additional space is needed and would allow for a wider array of physical activities. Others students feel that the money would be better served abridging some of the negative effects of the current budget crisis. Though the center is still in the developmental stages, there are some features that are likely to be included. The current plans allocate 8,084 square feet for a multi-activity court that can be used for basketball, volleyball, badminton and other indoor sports. Additionally, 18,000 square feet are committed to a weight and fitness space, and 5,500 will be apportioned for three multi-purpose group fitness studios, according to the most recent site analysis report. In addition to recreational and wellness-based features, the plan also allows for 13,180 square feet for events space, including a floor space, stage and other related components. “I want a place where students can socialize and have that student experience, a chance to get away from academics and take a break from studying and enjoy physical activity and socializing with friends,” said Ryan Fetzer, intramural and sports club coordinator. Dalpe maintains that many of the decisions will ultimately come down to the students, as they were the ones who expressed a need for a new recreation center.